With optional vertical battery grip. The OLED electronic viewfinder and 3-inch LCD. 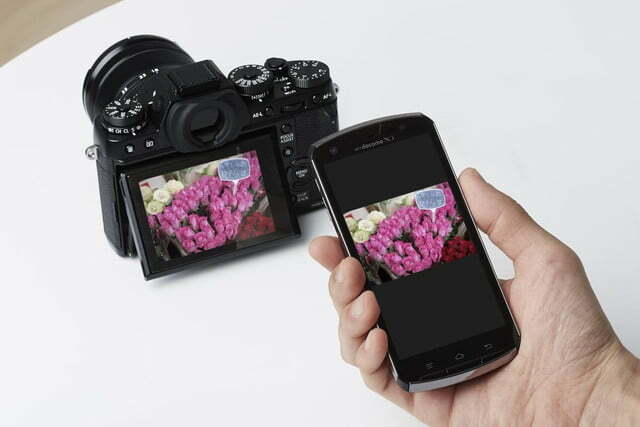 An example of how the X-T1 works with a smartphone (remote view) over Wi-Fi. Read our full Fujifilm X-T1 review. 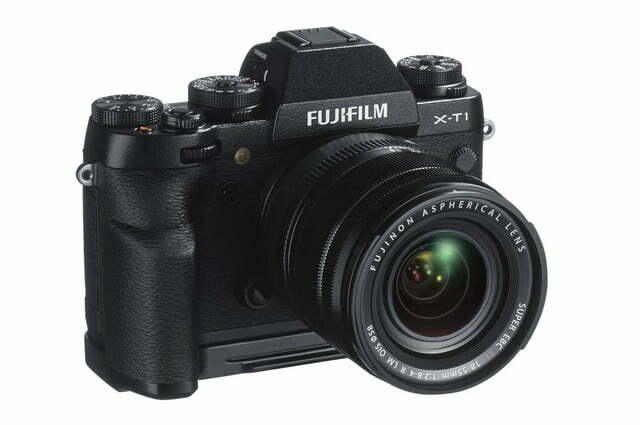 [Update on March 17, 2014: Fujifilm has acknowledged that certain models of the X-T1 may suffer from light leaks, where unintended light manages to seep into areas of the camera that are properly sealed, causing images to be improperly exposed (unless you like that lo-fi look). The company is offering a repair service to owners who are noticing this issue. If you own at X-T1 and are wondering if your camera may be affected, here’s what to look for. First, check your camera’s serial number – those with numbers higher than 41A05201 should be fine. Second, the issue may occur when the cover door on the left side of the camera is open – check to see if this is the case by taking a 30-second exposure at ISO 12,800, with the lens cap on, and shining a flashlight around the camera and into the opened compartment. If the image shows any streaks of light on what should be a completely dark exposure, you should send the camera in for a checkup. Click here for more information at Fujifilm’s website, or call them at (800) 659-3854 (x3461). We have been in love with Fujifilm’s X-series cameras for some time now. The rangefinder-style cameras have that great retro look, sturdy build quality, and strong performance. If you’ve had your eye on one of the mirrorless, interchangeable lens models but wished for a more DSLR-like body, then you’ll want to get your hands on the new weather-resistant X-T1. Fujifilm had already teased the public about this new camera a little over a week ago, so the announcement doesn’t come as a surprise. What we do know now, however, is the name, specs, and price and availability. 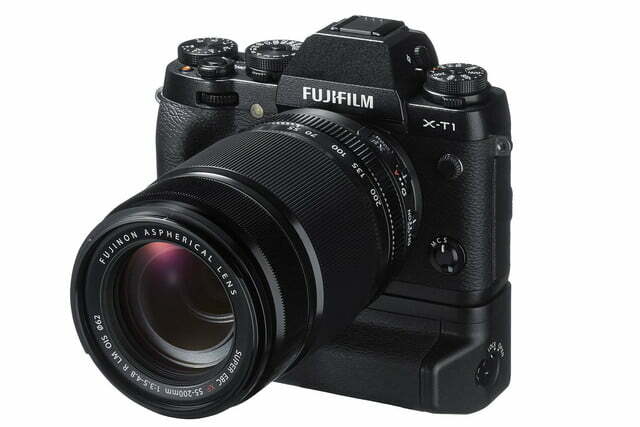 The X-T1, specs wise, has similar traits to the X-E2, but there are some new features unique to the X-T1. From the specs and the look of the camera, we are guessing Fujifilm is going after Olympus’s new OM-D E-M1 flagship. The body-only configuration will sell for $1,300, available in February. 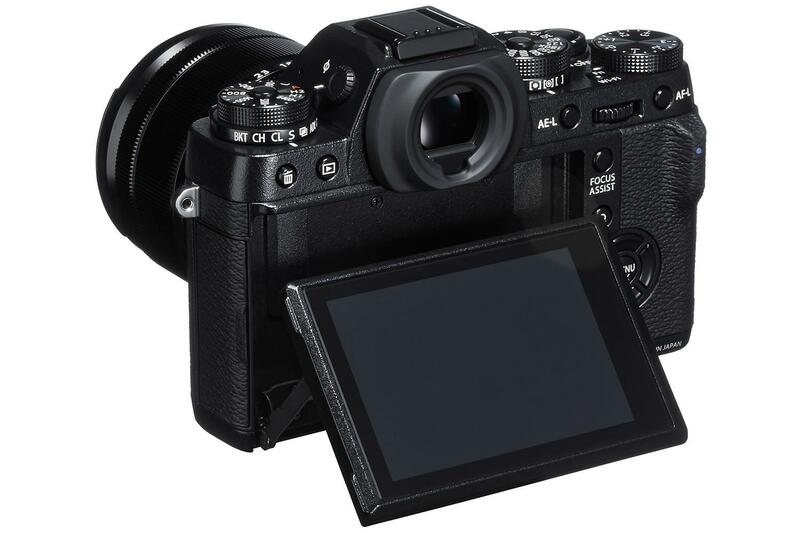 The 16.3-megapixel X-T1 uses Fujifilm’s APS-C X-Trans CMOS II sensor and EXR Processor II, two components that have been heralded by many users (us included) for their prowess in delivering great image quality. Fujifilm claims the camera has the fastest autofocus (phase detection) in the category, at 0.08 seconds. Startup time is 0.5 seconds, while shutter time is 0.05 seconds and shooting interval of a half-second. Burst mode is 8 frames per second, and ISO ranges from 200 to 6,400 (expandable to 25,600, but we rarely ever go that high and got good results with almost any consumer camera). Other shooting features include in-camera RAW conversion and interval timer for time-lapse photography. The die-cast magnesium camera body is Fujifilm’s first weather-resistant compact system camera (CSC), with 75-plus points of weather sealing to keep out dust and water; it’s also freezeproof down to minus-14 degrees, and the LCD is made with tempered glass for extra protection. A prominent feature on the camera is the wide-angle OLED electronic viewfinder (EVF) with 2.36-million-dot resolution. OLED EVFs aren’t new in Fujifilm cams, but this one has the world’s highest magnification (0.77x) and shortest display lag time (0.005 seconds), Fujifilm says. Like many of the best EVFs available now, we expect this to be incredibly responsive. There are also four display modes when viewing through the EVF: Full uses the 0.77x magnification to give you an enhanced view; Normal is the regular view with settings info; Dual is designed for manual focusing (with Digital Split Image and Focus Highlight Peaking for greater control over the scene); and Portrait that switches between Normal and Full when the camera is rotated. If you love dials, buttons, and switches, the X-T1 has a lot of them. There are mechanical dials for shutter speed and metering, ISO, and exposure compensation on the top deck. There are also six customizable buttons and command dials on the front and back. All of these manual components give the X-T1 a truly retro feel reminiscent of old film cameras or high-end DSLRs. Like every new camera, the X-T1 has Wi-Fi. Besides the sharing and upload of images to your smart device, you can use the Fujifilm Camera Remote to control the camera. 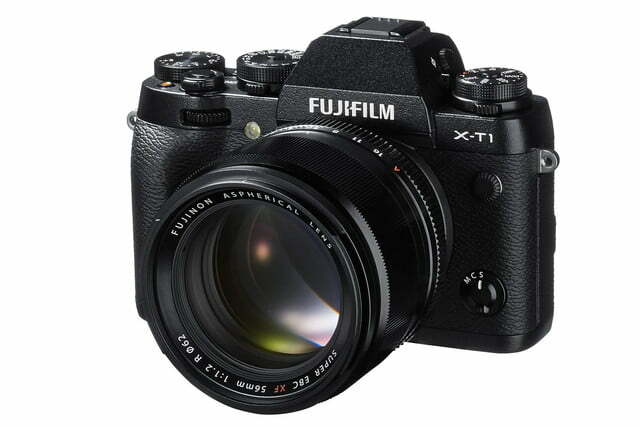 The X-T1 is also the first CSC to support SDXC UHS-II cards, according to Fujifilm. The card is twice as fast as a standard SD card. Fujifilm also created an optional vertical battery grip for pros that might be working out in the field for a while. Other options include a leather case, handgrip, and flashes, to name a few. The camera is only fully weather resistant if it uses a complementary lens. Fujifilm will make available three weather-resistant versions of its zoom lenses: the XF18-135mmF3.5-5.6 R OIS WR, XF16-55mmF2.8 R OIS WR and the XF50-140mmF2.8 R OIS WR. As mentioned, the body will sell for $1,300. 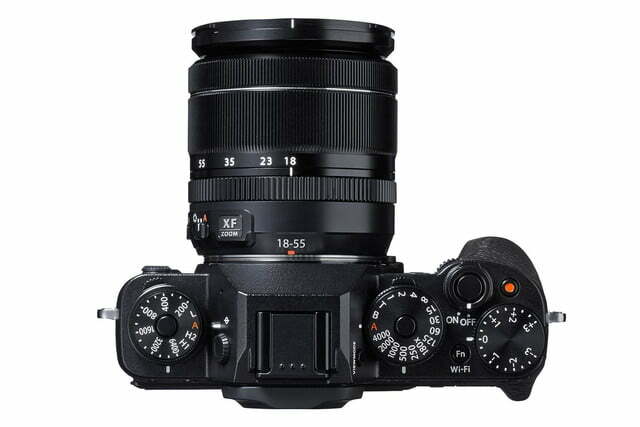 A kit option that comes with the XF18mm-55mm (27-84mm) F2.8-4 lens (non weather resistant) lens is available for $1,700. Obviously, if you don’t already own X-mount lenses, this beautiful camera will cost you.